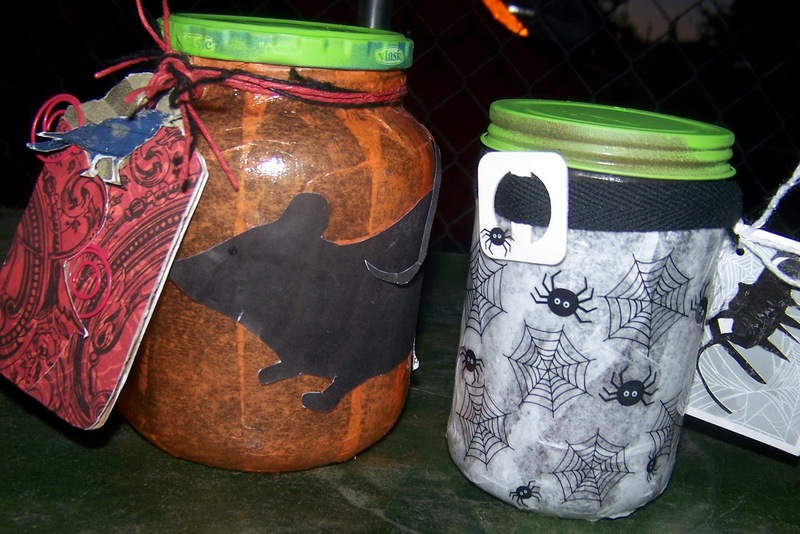 Join us at Just a Scrapin' for this weeks challenge a 3D Halloween project! Any thing you want to make any colors. I did 2 jar lights (I no longer do pumpkin carving) this is a modpoge with tissue paper project that I use candles outside but the small LED candles can be used esp. inside or with smaller children. First I picked colors I wanted then what I'll put on the face of the jar. I started with a modpoge layer of tissue paper. The orange jar is in strips and the white is done with tore chunks any size and shape. Next the rat modpoge layered over the orange while the spiders are stickers all over the place. I used Cricut Art Philosophy Tag 4 at 3" for the Raven/Nevermore tag hung with black and orange twine. The spider tag is Rctngle1 with a computer gen sticker of a large spider on one side and a large corner web on the other hung with yarn. The lids are spray painted with Liquitex professional Spray Paint Fluorescent Green. Check out Just A Scrappin' to see what the other Design Team members made for this weeks fun project. Really great projects! Congratulations on your blog : ) I am a new follower as I love to support those who are newer to blogging. I would love for you to come by Julie's Open Window and follow along...there's ALWAYS something fun going on!